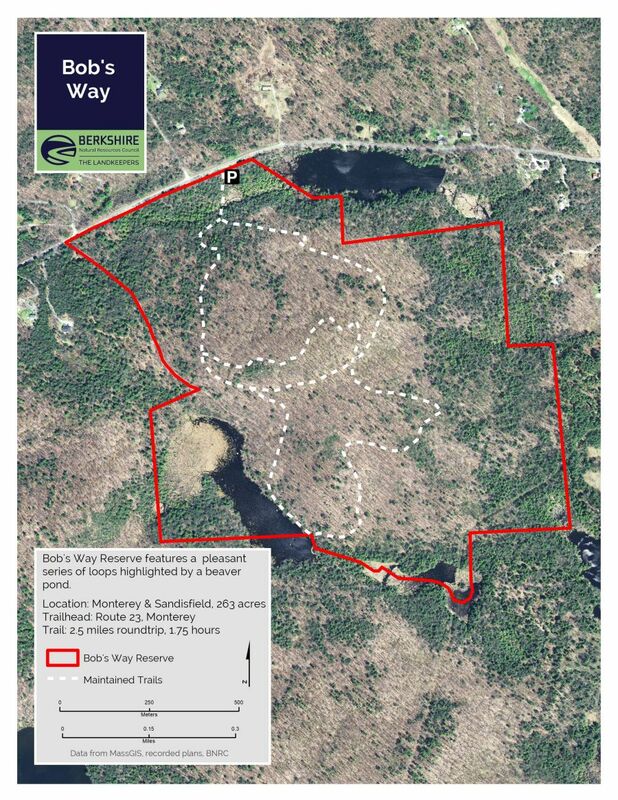 The looped trails and 263 acres of Bob’s Way provide typical New England landscapes: forested small hills, old foundations and stonewalls, a wetland, and a beaver pond. The outer loop takes about one hour. Two crossing paths can extend or shorten hikes, and one rises to the land’s high point, with a bench and an overlook..
From Monterey: Follow Route 23 East 2 miles and the parking lot and trail head will be on south side of the street. If you hit the beaver ponds of Otis, turn around. The outer loop and crossing trails are ideal for hikers, snowshoers and cross-country skiers. 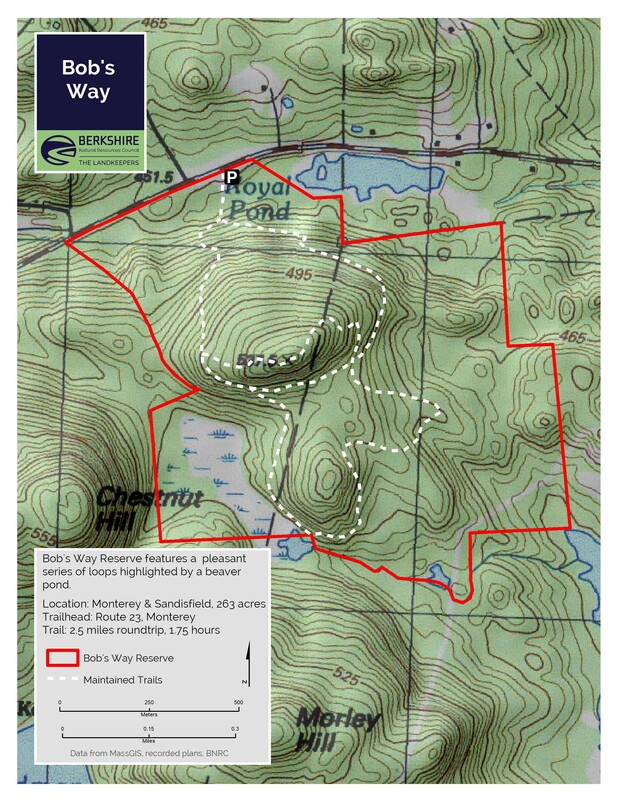 Hikers on Bob’s Way will have the choice of splitting off onto Cathcart Crossing, that gradually climbs in elevation and leads to a sculpted-stone sitting place, Dave’s Bench, or Truman Dowd Crossing. The Truman Dowd Crossing, accesses the sunny southerly side of this hill, providing an east-west route across the property without the climb required by the Cathcart Crossing traverse. The Bob’s Way Loop, the exterior loop, winds through mixed woods, climbs gentle slopes, and offers views of a wetland. It passes by the Markham/Dowd colonial era stone foundation, the main wetlands on the property, and several abandoned charcoal hearths. Here you have wide wood roads that are perfect for cross country skiing or keeping track of bounding children. The trail along the swamp flowers with mountain laurel in the spring, and in the past viewers could marvel at the comings and goings of herons to the nests in the rookery. Unfortunately, in 2010 a severe wind took down many of the dead trees in which the herons nest, but hope remains that they will be rebuilt. Also near the pond and just off the loop trail in the woods is a more puzzling historical remnant: an abandoned motorboat. Draped over two unnamed hills in the center of the property, Bob’s Way is artistically bounded by water in a landscape of rolling backlands. A circular line drawn around the property would lie tangent to, encompass, or straddle water of some sort. The reserve is a close neighbor to LakeGarfield, which lies to the northwest. Royal Pond stretches to the east; a large beaver swamp sits smack in the southwest corner; a stream runs along the southern boundary, and the property just “kisses” the edge of Gilder Pond to the southeast. Bob’s Way lies on the south side of Rte. 23. It’s nearly bisected by the Monterey/ Sandisfield town line. The gravel parking area on Rte. 23, just east of Mt. Hunger Road, is plowed in winter, though plowing is sometimes delayed by a day or two after an especially heavy snowfall. 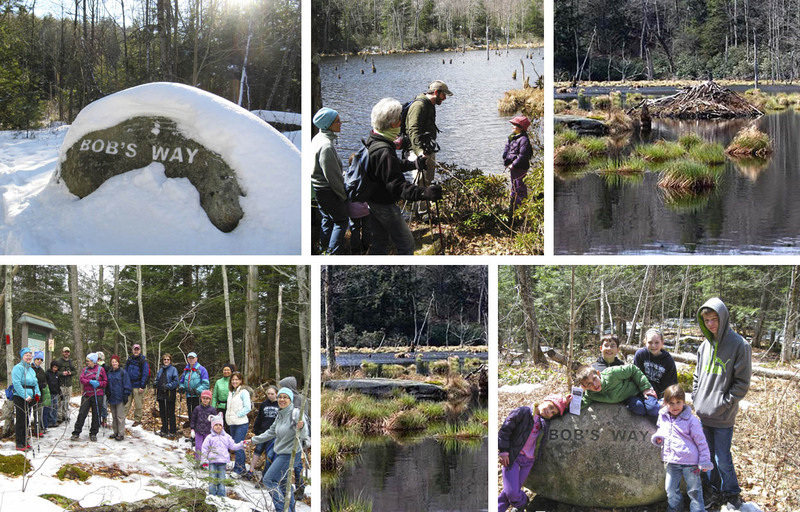 An informational kiosk will be found a minute or two after passing the entry boulder and crossing a short boardwalk over the wetland at the inlet to Royal Pond. This will give you your first taste of amphibians, wetland plants, overarching hemlocks, and fall-colorful red maples. Local historians believe the Revolutionary War era Ticonderoga-to-Boston Knox Trail most likely passed near or through the property, which was first settled by the Markham family. In 1780 Benjamin Markham was the local constable, and the property was still in the Markham family in 1876. While the house was gone by 1906, the stone foundation located along old West Street remains. The Markham family married into the Dowd family, whose member Truman Dowd farmed this area from 1789 to 1864, hence the name Truman Dowd Crossing for one of the inner trail connections. The first loop takes a turn to the Cathcart Crossing, which gives access to the highest point on the property via steep stone steps that make quick work of the 300’ vertical climb. Near the summit you arrive at a vista and Dave’s Bench, a rustic stone structure built in 2004 in memory of David Cathcart, a Monterey resident. At these upper elevations, mountain laurel lines the trail – most years they’ll be in full blossom around the third week of June. 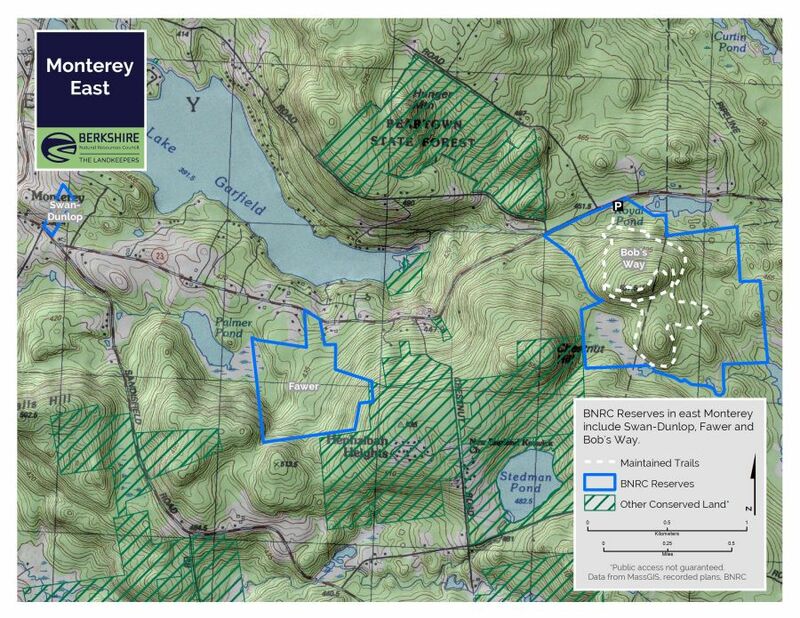 The property is named for N. Robert Thieriot, who bought the land in 1983 and put a Conservation Restriction on it in 1997, a year before he gave the land to BNRC. Bob died on December 31, 1998 at the age of 52, leaving a legacy as one of the greatest conservationists in Massachusetts history. He conserved over 4,500 acres in the Berkshires, and imprinted himself on the memories of friends and family as a complex character – alternately generous and withholding, impulsive and intractable, gentle and bruising. When the trail was dedicated in 2004, BNRC asked Bob’s family if they’d like to give the place a memorial name. Bob’s Way’s woods offer a mix of Northern hardwoods, hemlocks, and occasional white pines, with stretches of mountain laurel. The forest, pond and wetlands are home to porcupines, otter, among other mammals. You may get to glimpse one of the beavers that keeps these marshy areas flooded to create prime habitat for a host of other wildlife. Near the pond is a mature oak – complete with a Berkshire Natural Resources Council sign – that a beaver gnawed halfway through at some point. The pond has also at times provided nesting sites for herons.